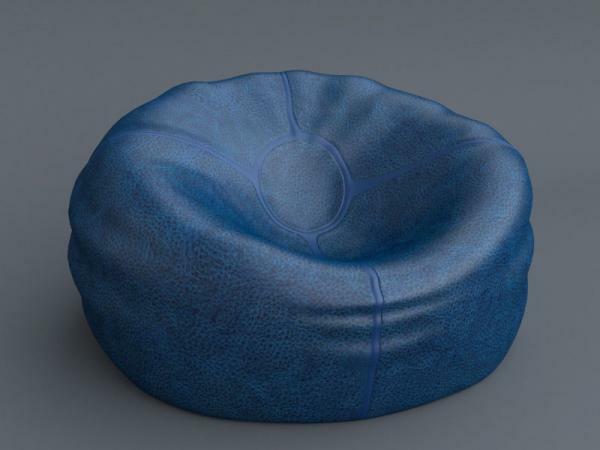 A detailed, sumptuous, leather beanbag in several color upholstery/color options, offering a comfortable adornment to your arch/viz or character scenes. The model is available as a native 3dsmax 2012 scene file (.max), and also in several scaled .obj formats, for importing easily into other applications, like Blender and Poser. It comes complete with color, specular, and bump maps, and two distinct material groups; one for the overall leather of the bag, and one material group for the trim/seam. There are 3 different color variations; blue, mauve, and black. The object is carefully UV unwrapped to provide no distortion in the textures. I've also provided the UV coordinate templates for creating your own custom textures, if you wish. However, any tileable texture should work very nicely. You are free to use or modify this object as you see fit, for use in your scenes as a prop, or any other type of scene where you may need a unique and relaxed furniture option. This model is free to use for both commercial and non commercial renders. You may not, however, resell this object, or any derivative of it; individually or as part of a package/set. 2Loose2Trek (6 months ago) Inappropriate? Humanoid (7 months ago) Inappropriate? So comfy, just love it! Thank you! aagung (3 years ago) Inappropriate? arif (3 years ago) Inappropriate? Thank you very much for sharing. It is a great object and my V4-characters will like it! ddpvy (5 years ago) Inappropriate? Edheldil (5 years ago) Inappropriate? very interesting models of blood cells too :)) with a new texture and other 3-4 models, a "Hemoglobin" scene can be created.Some day i will download and use with credits ofc.Maximum voted and thousand thanks in advance. Thanks for sharing this, very nice! Just as I remembered mine!! Thank you!! And using Poser Morph Brush tool, or even dynamic cloth room settings, one may adjust the shape as required for the render. Thanks for this item. Good stuff.